Dressed in all black, Deepika made her way out of the local airport last evening. 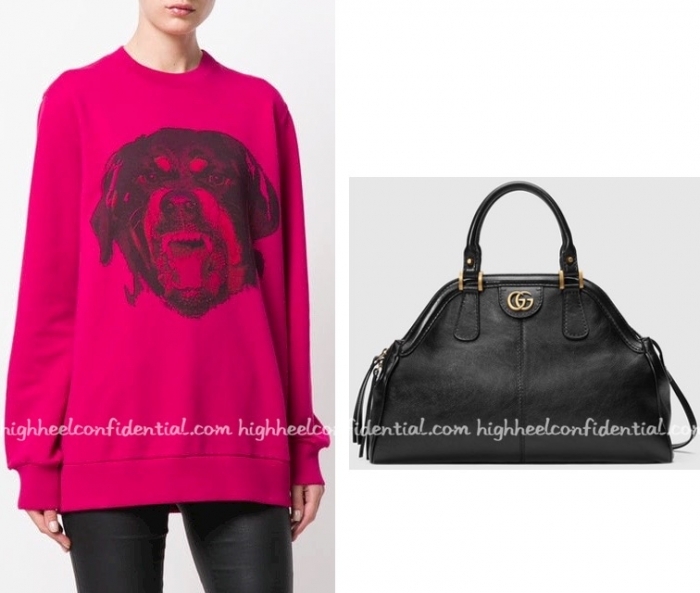 And, her look included a Givenchy bomber jacket and Celine ‘Luggage’ tote. While it might not be everyone’s cup of tea, it’s got to be said, Deepika made the off-duty look work for her. As she was exiting the local airport, Karisma was photographed in a Givenchy rottweiler-print sweatshirt, one that she teamed with a pair of black leggings. Her choice of accessories included a roomy Gucci tote. It was black for these leading ladies as they traveled to and from Mumbai recently. Whose look is more you? P.S. Deepika is wearing a Balenciaga tee and Gucci bag, Katrina is wearing a Givenchy sweatshirt.